The capital of Kerala has got a mouthful of a name: Thiruvananthapuram. Earlier called, Trivandrum, the name by which it is still called, is home to the rich Shri Padmanabhaswamy Temple and some interesting Victorian museums. Besides, the city is the base for visiting the nearby seaside holiday spots of Varkala and Kovalam. 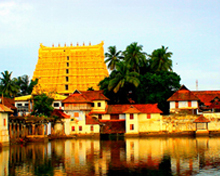 One of the richest temples in India, Padmanabhaswamy Temple is built in the Dravidian-style. Dedicated to Lord Vishnu, the temple has an antiquity of centuries. However, the structure in the current form came into being in the 18th century and boasts an impressive seven-story-high goparum, or entrance tower. Off limits for the non-Hindus, the temple enshrines an 18-foot idol depicting Lord Vishnu reclining on a five-headed sacred snake. At the temple is a huge tank, where worshippers take holy dips. 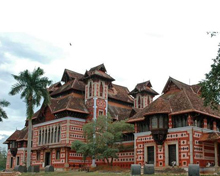 Located in the Fort area near the Sree Padmanabhaswamy Temple, the 18th-century Kuthiramalika (Puthenmalika) Palace Museum displays treasures of the royal family including paintings, weapons, portraits, ivory carvings, ornate thrones and other artifacts. Also called Horse Palace thanks to the presence of the carved horses, the two-storeyed museum is a beautify creation of the architects. Designed by British architect Robert Chisholm, this Indo-Saracenic structure is famous for its eclectic repository of bronze stone statues , Buddhist sculptures, paintings of Raja Ravi Varma and Nicholas Roerich, a golden chariot, ivory carvings and a 7th century statue of Vishnu. The complex also houses Trivandrum Zoo, one of India's oldest and best. Located inside the Kerala Tourism complex, Museum of History & Heritage is a valuable introduction to the history of Kerala throughout the millennia. Exhibits of the museum include Iron Age implements, bronze and terracotta sculptures of gods and goddesses murals, coins and paintings. The museum is 2 km from the Bus terminal. Kovalam today is one of the most famous places for holiday. 16km south of Trivandrum, the place attracts sun-seeking vacationers who can unwind or experience water sports on the three adjacent crescent beaches located in the area. While Lighthouse Beach and Hawa Beach are crowded, Samudra Beach is quiet and insolated. One of the famous excursion sites from Trivandrum, Varkala is the place where you should be able to club spirituality with nature. 55km from Trivandrum, this seaside resort is famous for its 2,000-year-old Vishnu temple of Sri Janardhana Swami which attracts Hindu devotes in large number. The red cliffs at the Varkala Beach offer awe-inspiring view of the sea. 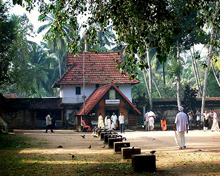 The Sivagiri Mutt, set up Sree Narayana Guru, a social reformer of 19th-20th India is an added attraction in Varkala. Thiruvallam, six km south of Thiruvananthapuram, is famous for ancient Parashuram Swami temple. It is the only temple in the state of Kerala dedicated to Lord Parasurama. Located on the way to Kovalam, the backwater destination of Thiruvallam is situated on the banks of the Karamana River. The largest fresh water lake in Thiruvananthapuram district, Vellayani Lake is rich in avian population. Nine km from the Thiruvananthapuram Central Bus stand, the lake is home to more than 100 species of birds and 42 species of fish. GLossy IBis, Asian Opnebill and Siberian stonechat are the prominent species among the 23 migratory birds that are attracted to the lake. A day in the green environs of scenic surroundings of Aruvikkara will be fabulous for the spirit. Aruvikkara Dam, built across the Karamana river, has a large water reservoir which is used to supply water to the city of Thiruvananthapuram. The small shrine of Durga, sititng atop on a large huge rock attracts deovtees. The stream near the Aruvikkara Dam is full of swarms of fish fed by the visitors. Aruvikkara is 37 km from Thiruvananthapuram. 17 kilometers from the hustle and bustle of Thiruvananthapuram. The 8th century rock cut cave temple at Vizhinjam is a quiet place where you can soak in spiritual energy. The temple is a protected monument under Archaeological Survey of India (ASI). Once a port town and capital of the Ay kingdom, Vizhinjam was coveted by the different dynasties intending to control it. 40 km away from Thiruvananthapuram, the scenic Neyyar Dam offers the stunning view of the reservoir against the backdrop of the Western Ghats. Within the walking distance of the dam is the Crocodile Rehabilitation and Research Centre where you can spot gharials and crocs lying around in the sun. Situated at the southernmost point of peninsular India, Kanyakumari is the meeting point of the Arabian Sea, the Bay of Bengal and the Indian Ocean. The sunset at the juncture where trio meet is stunning. 87 km from Thiruvananthapuram, Kanyakumari is Tamil Nadu. 60 km from Thiruvananthapuram, the hill resort of Ponmudi is defined by clouds and mists. 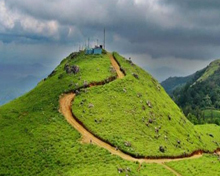 Located at an elevation of 912 m above sea level, Ponmudi abounds in tea and rubber estates. Air: Thiruvananthapuram international airport is connected by flights from major cities in India and abroad. Rail: Thiruvananthapuram is a major railhead connecting several important cities and places in India. Road:	Thiruvananthapuram is connected by good motorable roads to all important places in South India. Some of the cities and places connected with Thiruvananthapuram by road are Kochi (220km), Thekkady (253 km), Wayanad (360 km), Trichy (469 km) and Chennai (708 km). Accommodation in Thiruvananthapuram is very easy to acquire as the city is filled up with lots of resorts and hotels catering to the needs of everyone. A wide variety of hotels are available in Thiruvananthapuram to meet the needs of the tourists. Whether one is traveling for pleasure or business, Thiruvananthapuram has a wide array of accommodation options to choose from to suit all budgets. The royal heritage hotel, Hilton garden Inn, residency tower, Vivanta by Taj, Travancore Stay, Greenfield Inn, The Platinum Inn, Hotel Silver Sand, Hotel Dubai International and Hotel Galaxy Inn are some of the famous hotels in Thiruvananthapuram. Visitors are advised to book in advance during the peak season.